Eblana has been supplying lasers to the high volume, fiber optic communications industry for the past decade. 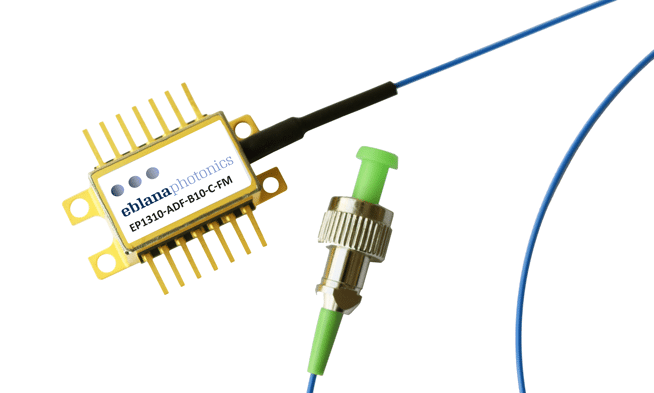 With a range of high-performance competitive products, the name “Eblana” has become synonymous with quality laser products delivered to the world’s largest optical transceiver manufacturers. Eblana’s narrow linewidth lasers are the preferred choice of the Optical Test and Measurement industry due to their extremely narrow linewidths and affordability for a wide range of applications. Eblana’s flagship EP1550-NLW product has been deployed in a host of test, measurement and imaging systems. Eblana’s 1310 nm FP Laser delivers unrivaled 10 Gbps performance at affordable pricing. Its InAlGaAs composition provides for reliable, uncooled operation over a wide operating temperature range. Tight uniformity of key parameters ensures unsurpassed high volume manufacturing efficiencies. Eblana’s 1310 nm DM Laser delivers unrivaled 10 Gbps performance at affordable pricing compared to conventional DFB technology. Its strained quantum well InAlGaAs composition provides for reliable, mode-hop free, uncooled operation over a wide operating temperature range. Eblana’s 1550 nm 2.5G FP Laser is the preferred choice for deployment in mass market point-to-point optical communications applications. High performance and long-term reliability are a given with this 1550 FP laser. Its InAlGaAs composition provides for reliable, uncooled operation over a wide operating temperature range. Tight uniformity of key parameters ensures unsurpassed high volume manufacturing efficiencies. Eblana’s 1550 DM laser delivers a high performance, single wavelength source at very competitive price points for mass market fiber communications applications. Its strained quantum well InAlGaAs composition provides for reliable, mode-hop free, uncooled operation over a wide operating temperature range. When compared to conventional DFB laser technology, Eblana’s 1550 DM offers compelling performance and cost advantages. Eblana’s Narrow Linewidth (NLW) series lasers set the standard for monolithic, ultra-narrow linewidth laser emission at 1550 nm. These products are available in 100 kHz, 200 kHz and 400 kHz versions and may be supplied with SMF or PM fiber depending on requirements. Each laser module is supplied with a full set of characterization data. Eblana’s 1310nm ADF series laser is a high-performance single wavelength source, available in a 14-pin butterfly package with PM fibre pigtail. The frequency response and linearity of this laser makes it an excellent choice for long reach analog transmission systems such as CATV. Each laser module is supplied with a full set of characterization data. Eblana’s 1550nm ADF series laser is a high performance, high power single wavelength source, available in a 14-pin butterfly package with PM fibre pigtail. 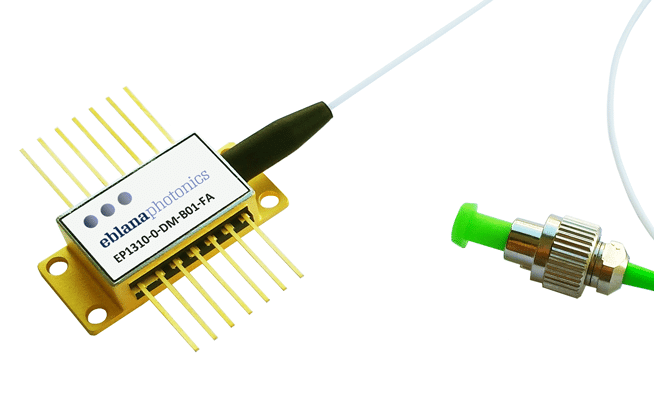 The high output power and low RIN and linewidth of this laser make it perfect for DWDM applications in combination with an external modulator. Each laser module is supplied with a full set of characterization data.